← A Week to Celebrate Books, Reading, and Dialogue! Celebrating Banned Books Week without calling attention to the special way that fictional story-telling can create dialogue would be an oversimplification of the week’s mission. In fact, often times a fear of that dialogue — a fear of the difficult discussions that don’t always have a clear answer — is what causes book-banning and controversy to happen. Fiction has the potential to create space for the examination of social and cultural issues in a prismatic and multi-dimensional way. Sharing a story and experience, even if fictional, helps illuminated social and cultural issues. Books encourage individuals to think, and question, and thus help people heal and grow. Books give readers the chance to study the different sides of a complex issue, and revisit those issues as often as they wish. Author Amy Waldman’s Kafka Prize winning post 9/11 novel, The Submission, at once shares with readers the potential for personal healing, dialogue, and growth, yet also describes that process as it plays out among characters in her story. SBAI is looking forward to this evening’s discussion with Waldman. We can’t wait to hear about her writing process and inspiration for her award-winning novel. 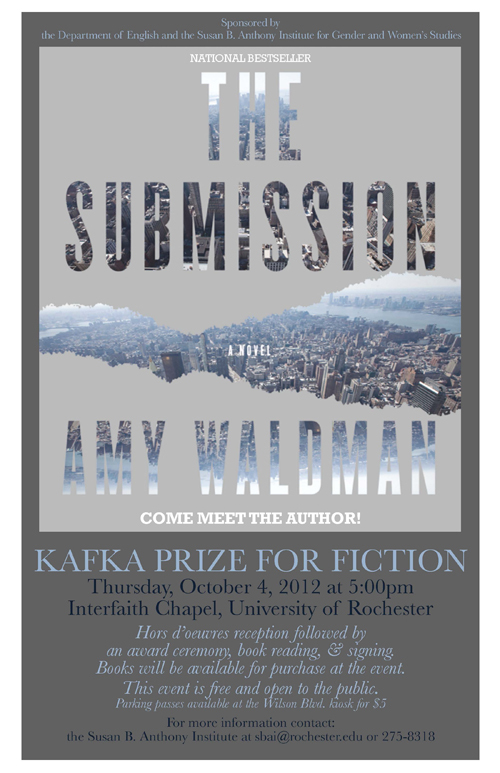 See you tonight at 5pm in the Interfaith Chapel! This entry was posted in SBAI Events and tagged #bannedbooks, #KafkaPrize. Bookmark the permalink.